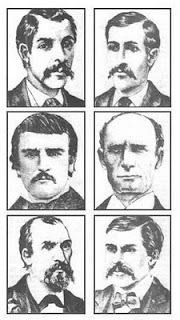 Accused: "The Blue Eyed Six"
It began with four men looking for a way to ease the extreme poverty that had befallen Lebanon County, Pennsylvania in 1878. All but one were married with children to feed— Israel Brandt had six children, Henry Wise had 7, George Zechman had 6. Josiah Hummel had no children but was having trouble supporting himself as an unskilled laborer. Wise was a coal miner. Zechman worked as a farm laborer and a coal miner. Brandt, who had lost one arm in a farm accident, was the owner of the Brandt Hotel in St. Joseph Springs. Their plan was to take out life insurance policies on Joseph Raber, a reclusive 65-year-old man living in an abandoned charcoal burner’s hut in the Blue Mountains. The hut had a dirt floor and ceiling too low for a grown man to stand up. He lived there with Polly Kreiser, referred to as his “housekeeper" but common law wife would be more accurate. Raber did farm labor when he could, but mainly lived on public charity. The four men had promised to take care of Raber if he would make them beneficiaries of the insurance policies and Raber was pleased to do it. The type of insurance they bought was called assessment insurance also known as “graveyard insurance.” It was primarily sold to guarantee that the insured would have enough money to be buried when he died with a little extra for his survivors. The concept of assessment insurance was simple; the insured paid a premium to join a pool then when any of the members died, the rest in the pool were assessed a certain amount that was then given to the beneficiaries. For example if there were a thousand people in the pool and the assessment was $1.00, a beneficiary would be paid $1000. 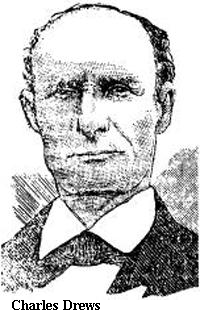 Josiah Hummel’s policy on Joseph Raber was worth $2000, George Zechman’s was worth $2000, Israel Brandt’s was worth $1000, and Henry Wise’s was worth in the neighborhood of $3000. In practice, assessment insurance was similar to a pyramid scheme where the member who died first stood to gain the most. As members died they would have to be replaced to maintain the value of the policy. As time went on, living members often chose to opt out of the pool rather than continue paying assessments. Joe Raber was old but he was relatively healthy and showed no signs that he would be dying anytime soon. The constant assessments required to stay in the pools were becoming a financial hardship for his insurers. They realized that they could not afford to let Joseph Raber live any longer. They made and abandoned several murder plans, including throwing Raber from a flatboat into a reservoir and poisoning him with chloroform, before admitting they were not able to do the killing themselves. Israel Brandt approached his neighbor, Charles Drews, and offered him $300 to murder Raber, and promised he would get the same amount from the other conspirators after the job was done. Drews, in turn, sought help from his son-in-law Joseph Peters and Frank Stichler, a local thief. Peter’s turned him down, but Stichler agreed to help for a price. 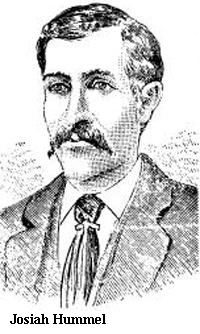 Around dusk on Saturday, December 7, 1878 Drews went into the tavern at Brandt’s hotel and told the people there that Joe Raber was dead. That afternoon he and Stichler had paid a call on Joseph Raber and offered him some tobacco if he would accompany them to Kreiser’s Store. Raber agreed to go with them. The trip to the store had required crossing Indiantown Creek on a crude bridge made of two twelve inch planks. Drews said Raber had a dizzy spell part way across, fell into the water and drowned. The following day a coroner’s jury examined the body and declared the death accidental. 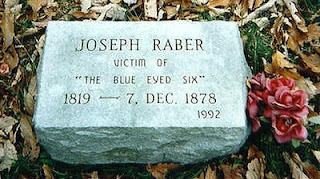 The Death of Joseph Raber, He is Supposed to Have Been Murdered. Six Men Arrested, Charged with Crime. 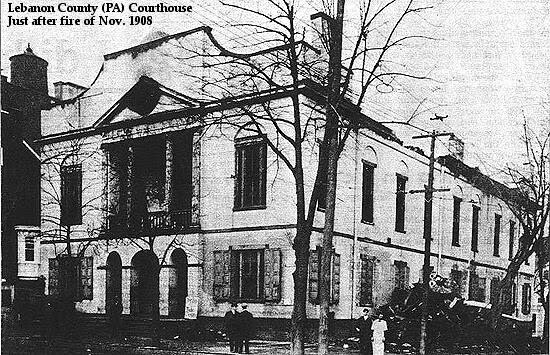 At the prompting of one of the insurance companies, Lebanon County constables questioned Joseph Peters regarding Raber’s death. 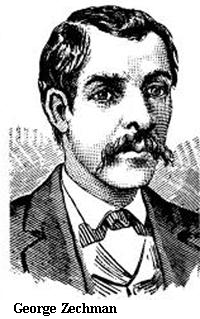 At 4:00 a.m. on February 5, 1879, Peters admitted to seeing Drews and Stichler drown Joe Raber. They had walked across the planks in single file with Stichler in the lead and Drews in the rear. About half way across, Stichler turned around, grabbed Raber by the shoulders and threw him into the water, then held him under until he drowned. Peters also accused the other four men of planning the murder. That morning Israel Brandt, Henry Wise, Josiah Hummel, George Zachman, Charles Drew, and Frank Stichler were arrested for murder. The trial was presided over by Judges Henderson, Rank and Light. Fifty-eight witnesses testified, many of whom were German immigrants who spoke little or no English, and required a translator. 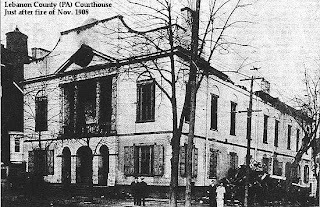 Doctors, insurance men, family and neighbors of the defendants were called, but the outcome of the trial rested on the testimony of Joseph Peters and his wife Lena. They had both seen Drews and Stichler drown Joe Raber from the second floor window of the Drews house where they were staying. The six defendants had five attorneys who did all they could to discredit the Peters’ testimony. They claimed it would be impossible to see the murder through the second floor window and actually brought the window into court. It had multiple panes, and all were too dirty to see through clearly. One pane was partially broken and rags were stuffed in the hole. The defense had witnesses who testified that Joseph Peters had been drinking all that afternoon and was drunk at the time he allegedly saw the murder. They also brought out the fact that Peters was currently AWOL from the army. Then there were the personal connections—Joseph Peters was fully aware of rumors that his wife Lena, Charles Drew's daughter, had been cheating with Frank Stichler while Peters was away in the army. In the end none of it mattered. The jury deliberated for five hours then returned a verdict of guilty of first degree murder for all of the defendants. Following the verdict all six defendants requested a new trial. While awaiting sentencing Henry Wise made a full confession. At the sentencing Judge Henderson granted George Zechman a new trial. Zechman’s involvement in the conspiracy was based solely on statements made by other defendants which would have been inadmissible if he were tried alone. Drews, Stichler, Hummel and Brandt were sentenced to hang. Wise would be sentenced later. It was assumed that Wise had cut a deal— confession in exchange for a life sentence. The other four convicts then issued their own confessions, placing as much blame as possible on Wise. In the end though, Wise was sentenced to hang as well. 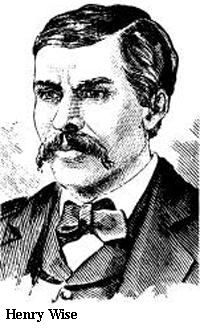 The hangings were postponed until the outcome of George Zechman’s second trial. Zechman was retried and found not guilty. 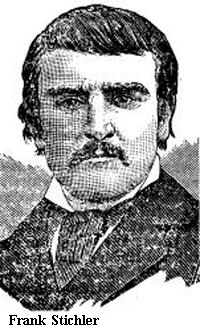 He had participated in the insuring of Joseph Raber, but the jury determined he had not been party to the conspiracy. He was a known insurance investor and had insured many people in the past with no foul play. 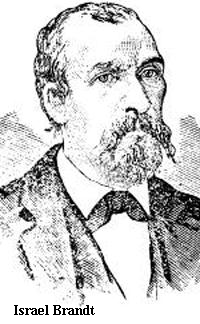 On November 14, 1879, the day after Zechman’s verdict was read, Drews and Stichler were hanged. On May 13, 1880, Brandt, Hummel and Wise were hanged. 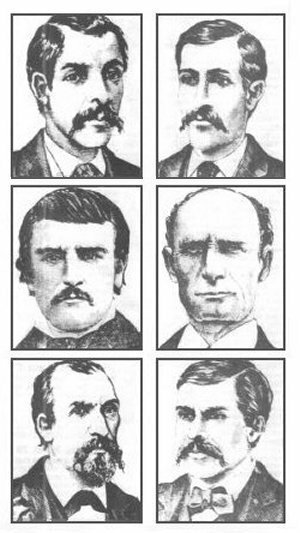 The Infamous Blue-Eyed Six of Lebanon Co., Pa.
Carmean, Edna J. The Blue Eyed Six . Lebanon, PA: Sowers Printing Company. 1974. Ludwig, Gary The Blue Eyed Six: A Historical Narrative . Lebanon, PA: Hodge Podge USA. 1979. Joseph Raber is buried at Moonshines Church in LEBANON County, not Dauphin.